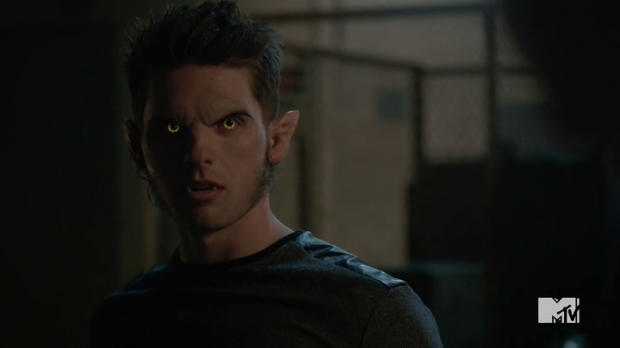 Teen Wolf‘s fifth season continues as episode 6 starts off with a flash forward to the end of the episode. The flash forward sees Scott and Malia fighting off the Dread Doctors but Scott being unable to do so because he can’t breathe. He reaches for his inhaler but the Dread Doctors step on it leaving Scott completely helpless. But we do get to see Malia in action this week. Her fight scene with the Dread Doctors was exciting and thrilling to watch. One thing is for certain, no one should underestimate Malia’s abilities. She’s much stronger than the pack gives her credit for. After Malia distracts the Dread Doctors, she escapes them by running into the elevator in the nick of time. It is there when Scott is distressed and admits that they should have never read the book given to them by Dr. Valack. It only ruined things for them. We should’ve never read that book..
Then the episode flashes back to before Scott and his friends read the book. Sheriff Stilinksi finally realizes that Donovan was a Chimera as well, another one of the Dread Doctors creations. Stiles still hasn’t told anyone that he was the one that killed Donovan and quite frankly, I’m finding all of this a little odd. Stiles is totally not at fault here which is why I still don’t get why he’s lying to everyone about it. It was self defense. Why is it so hard for him to come clean about that? I get that he feels the guilt for having killed someone, but it was an accident. They’re coming Lydia, they’re coming for all of us.. I actually really enjoyed the cinematography they did with all the flashbacks. It looked a lot like a thriller or suspense film and I really enjoyed that. They are going back to the style that made Season 3 so special as it was also focused on these elements. Lydia soon realizes that the flashback she got wasn’t the right one as her grandmother had nothing to do with the Dread Doctors. Scott on the other hand, isn’t so lucky. He has visions of dogs and realizes he is having an asthma attack, the first time we’ve seen him experience this since he became a werewolf. Scott recalls being in the hospital as a kid while having an asthma attack. Liam however comes to Scott’s rescue with an inhaler and they share an intense moment which was very heartwarming to see as it shows how much Liam cares about Scott and looks up to him. Stiles also hallucinates and sees his mother. He follows her down the hallway. He sees his mother say that someone is trying to kill her on the roof of the hospital. The Sheriff talks her down from her delusion. Stiles realizes that she is talking about him. She believes her 10-year-old son is trying to kill her and then she attacks him. Suddenly, she morphs into a chimera. I think this hallucination was very heartbreaking to see as it touched on Stiles emotional side by introducing his mother for the first time ever and how he reacted to all of it. Dylan O’Brien gives another great performance when it comes to Stiles vulnerability. Kira didn’t get any flashbacks and while it worried her, she was told by Mason that the reason the book wasn’t affecting her. Liam’s best friend has done research on Kitsunes and learned that they have trouble with language. Since the whole book is basically a language trick that affects the memory, Kira’s powers won’t let her process it. These aren’t the only problems Kira seems to be having. Her new aura and Kitsune powers are molding her into a different person altogether and she also seems to be muttering Japanese most of the time in her sleep. She has no idea what’s going on with her. I think it’s actually refreshing to see a different storyline with Kira and not one revolving around Scott. The writers have really stepped up their game and realize that Kira has a lot more potential and shouldn’t be reduced to simply being Scott’s girlfriend. She’s much more than that. None of this stops Theo from drifting the pack apart as much as he can. He tells Scott about Kira muttering in her sleep in Japanese and tells Scott that it translates to “Messenger of Death.” Scott confides in Theo and admits that he doesn’t trust Kira anymore. Not with her growing powers. So that makes two people Scott will ultimately end up in conflict with, Stiles and Kira. Very sinister on Theo’s part. You won’t tell anyone, Stiles. Because I didn’t say anything about Donovan either. Elsewhere throughout the episode, Hayden and Liam’s story seems to evolve. Their past is revealed and why Hayden hates him so much and I think it’s a step up from the dull character that she has been in the past episodes. Liam also discovers that Hayden is a Chimera and it comes as no surprise to me as Hayden had been acting odd in the past couple of episodes and had completely healed from an injury after being attacked by a Kanima. I think that was all we needed to know. Not that I care, I still don’t like Hayden. Malia however, was the star of the entire episode. I really enjoy where her character is going and I like how strong she is and how well she can manage things on her own. This episode showed her lying to Stiles about not having discovered who was behind her mother’s death when in fact Theo knew and he also knew that Malia was lying to Stiles about it. When Malia finds out, she goes looking for Theo and warns him that she won’t owe him anything. I think Theo has his sights set on Malia, and he’ll get her eventually. Poor Stiles. Although what I don’t like is Malia lying to Stiles about the Desert Wolf and Stiles not coming clean to Malia about Donovan. The trust that they have seemed to establish over the course of three seasons will slowly dissolve because of this one reason. In the last scene, Theo and Scott go back to the hospital where the newly turned Chimera is dwelling and where Stiles and Lydia went to uncover clues about her mysterious hallucinations. While Scott is being attacked by the Dread Doctors which is shown in the flash forward scene, the Chimera attacks Stiles and Stiles is almost about to die when he is saved by Theo who rips out the Chimera’s throat, instantly killing it. Theo begs Stiles not to say anything about the incident with the Chimera and when Stiles asks him why he says because he didn’t say anything about Donovan either. Ouch. Theo knows. Theo knows everything. Stiles, you better watch out. You have a real enemy here. Another entertaining episode but not without it’s flaws. I’m really enjoying Malia’s characterization this season and how strong she is. No one gives her enough credit for that. Her fight scenes with the Dread Doctors were just one of the many aspects that made me realize how much of an underestimated character she really is. I’m really liking her this season. However, that flash forward scene wasn’t necessary and it shouldn’t have been there to begin with. It didn’t lead towards anything and they should’ve simply kept it in the end. Another thing I enjoyed about this episode was a more developed storyline for Kira and one which did not revolve around Scott. Finally she has her own problems to figure out rather than ones revolving around Scott. Thank God for that and quite frankly, it was getting annoying. Also, while I get that a major plot line this season is the pack losing faith in each other, the execution is so poor and totally out of character. Everyone is lying to others about things they normally wouldn’t. Stiles lying to Scott, Stiles lying to Malia, Malia lying to Stiles and somehow, only Theo gets the truth. That’s not the way it should be. And while I did like the fact that Liam and Hayden’s back story evolved a lot more this episode, I still think Hayden is annoying and her character has nothing to offer. The whole Liam/Hayden storyline is really boring and why does everyone need a love interest? Liam surely didn’t. And if the reason why Hayden hates Liam is because he hit her accidentally and messed up a school photo than that’s a really lame reason to be mad at someone for so long. MOVE ON ALREADY.